We need a constant supply of new peer reviewers. If you would like to volunteer, please register at our electronic submission system by enter to http://turkishjournalofvascularsurgery.org/ This process will automatically add your name, contact details. 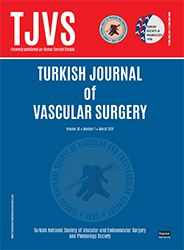 Do let us know once you have registered with an e-mail to editor@turkishjournalofvascularsurgery.org. Before registering, all interested reviewers must meet the following requirements and should acknowledge the following responsibilities. All interested reviewers must meet the requirements depicted below for Endovascular Surgery Society and Phlebology Society. The reviewer is invited to review a manuscript by an invitation e-mail which includes the proposed review duration (2 weeks) and their log-in information for the electronic submission system. Reviewer has to log-in to the electronic submission system in 2 days after he or she received the e-mail and must inform the editorial board if they will review the manuscript or not by selecting one of the two options in the system (“I Accept” or “I Decline”). Reviewer duties are no longer valid after 3 days since we assume that you are unavailable to respond to this request. The reviewer must complete the assigned review within the proposed review duration provided in the invitation e-mail (2 weeks).